Most people wouldn't expect to pay over £2K for a compact speaker system, but then Monitor Audio's Apex is anything but average. It's a slice of pure audio luxury, with each speaker housed in a precision-engineered enclosure and furnished with some of the best driver tech Monitor Audio has to offer. The system on test here includes four A10 speakers, which handle front and rear-channel duties and stand just 250mm high. They retail for £275 each, and that's before you've even added the bespoke stands at £250 per pair. They're joined by the A40 centre and AW12 subwoofer, £425 and £900 respectively. Pricey they may be, but they're worth it. Build quality is brilliant. The inert die-cast aluminium enclosures are robust and weighty, while the use of a metallic black lacquer finish, brush effect metal side trims and curved cabinets epitomise cutting-edge chic. Magnetic grilles leave no visible fixings – the icing on an already sumptuous cake. Inside the A10s a 1-inch C-CAM gold dome tweeter handles high frequencies up to and beyond 35kHz. Like the Silver RX range, the drivers are attached to the enclosure using a single through bolt fixing, which eliminates a possible source of distortion and acts as a brace to resist unwanted vibration. There's more clever tech inside the floor stands. Plonk the A10s on top and there's no need to connect up the cables as they're internally wired with built-in connecting forks. The A40 centre features the same technology and mind-boggling build quality as the A10s, but adds an extra mid/bass driver – the two flank the gold-dome tweeter in the middle. The A40 can be mounted on the tabletop using the supplied feet or on the wall with the attached brackets. Once in position it can be tilted up to 22.5° to suit the angle and position of your screen. The B. A. Baracus of this particular A-Team is the AW12 subwoofer, supplying a considerable 500W of muscle from its 12in long-throw C-CAM driver. Exclusive to the Apex system, this bass-monger is every bit as classy as the speakers, thanks to the spangled black lacquer finish and gorgeous metal side trims, but be warned – it's a lot heavier than its compact dimensions might suggest. The sub's volume and EQ controls are helpfully located on top – a godsend if it's tucked in a hard-to reach spot. There's a couple of buttons for two different EQ modes – the standard EQ1 setting offers the best overall balance for music and movies, while the movie-centric EQ 2 mode boosts output by an extra 4dB at 21Hz for added punch. On the back is a crossover dial, which goes from 40Hz up to 120Hz, but the low-pass filter switch will bypass this if you'd rather control it with your receiver. Phase control and line in/out sockets complete the lineup. The Apex offers a masterful performance with movie material. Right across the soundstage there's an astonishing amount of detail, unearthing sonic minutiae you might not have noticed before – even with movies you know like the back of your hand. I've seen The Dark Knight's monumental Batpod chase scene countless times, but this system suddenly had me noticing subtle noises and nuances in the surround design that slip under the radar on lesser compact systems. Engines sound extra raspy, while weapons load and fire with extra snap, crackle and pop. This level of insight and dexterity isn't entirely surprising at over £2K, but that doesn't make the Apex's talents any less incredible. It's also astonishingly powerful. I was expecting fireworks, but what I got was Bonfire Night and Bastille Day rolled into one. Herculean doesn't even begin to describe the low-end might afforded by the AW-12 – it's thick, punchy and tighter than a public sector budget. If you can remain seated when The Joker blasts his bazooka you're probably dead, but even when you decommission the sub there's still a healthy dose of bass in the mix thanks to the terrific bottom-end extension of the A10s and A40. What's more, high-frequencies are smooth as silk, speech couldn't be clearer if the actors were in the room and the rear soundstage is willfully expansive. And with music, this system nailed the emotion and energy of any recording I threw at it. Clean, full-bodied vocals, metronomic timing and wonderful detail reproduction make for a spine-tingling listen and reveal it to be a fantastic all-rounder. 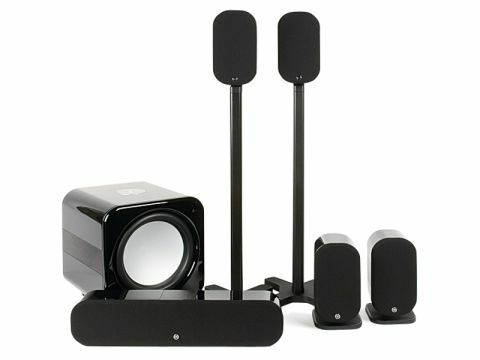 These speakers may be small, but their sound certainly isn't; if you have this sort of money to spend, you'll be hard pressed to find a better compact system.